When did you get into the luxury business and why? We got into the luxury business in 2008, which was a natural extension of our Indian designer wear retail business, which Genesis Colors has been in since 2001. As a result of our experience with high-end Indian designer wear retail with brands such as Satya Paul and Samsaara we had the market and consumer insights, which we could leverage for luxury. Was your family in the luxury business already? I come from a family of professionals, My father was in the Merchant Navy. 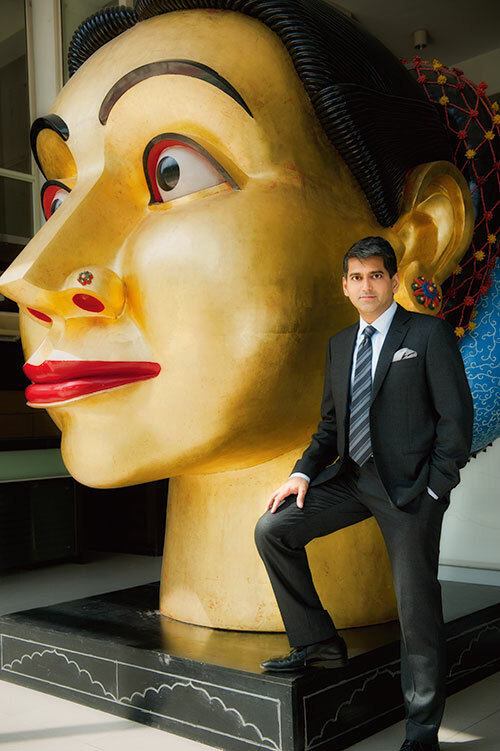 I started my career as a banker with Citibank in Singapore and then in India, but soon gave up my job as the entrepreneurial bug had bitten me. Sanjay Kapoor, when free, would do what? I would go out with friends to eat at a good restaurant or put on my running shoes and go for a run at Nehru Park. Or travel the world! What has been the reason for taking the `deluxe’ route? One of my passions has always been travel and I have had the good fortune to travel extensively across the globe. During some of these visits to the fashion capitals I have been inspired by the way luxury brands marketed themselves and wanted to bring these brands to India and offer the same experience to shoppers here. Loved my goldfish as a kid – none now! Energetic, impulsive; with springs in my feet! Work mantra according to Sanjay Kapoor would be? Be passionate about what you do; if you think you can do it, you will! Yes, I play golf occasionally and I run regularly. Do you have a weakness for fancy cars? Yes, Yes, Yes! Speed and technology in a car are a big turn on. BMW rocks! Which was your first luxury buy, personally? A Paul Smith jacket I bought many years ago. Is any other member of your family involved in Genesis Colors? It is a professionally run business – family is part of the professionals! The best way to understand your customers is to watch them shop. Even though I have a crazy work schedule, I try and take time to visit shopping destinations where I can watch and understand consumer behaviour. Apart from that of course we have a very strong in-house research oriented CRM programme, which helps us understand the market. Which is your most successful brand – international and national? National would have to be Satya Paul and international it is Bottega Veneta and Canali. Wildflower Hall in Shimla and most of Italy. My interest in art began when a dear friend Sharan Apparao introduced me to it and since then it has been a hobby. Some of my favourite artists include Alex Kersis, Sujata Bajaj, Ravinder Reddy, Ganesh Haloi and the Sri Lankan artist Senaka Senanayake, and their works do find pride of place in my home and office. Is art aesthetically appealing or do you view it as an investment too? I collect art mainly for the aesthetic appeal it has for me, but yes, I realise it is a good investment too. Would you take pride in discovering an artist? Certainly. It would give me great joy to discover new talent and if the works appeal to me I would surely patronise the artist. What was your last luxury purchase? Yet another Canali suit …can’t seem to have enough in my wardrobe! What triggered the CSR link with Tata Memorial Hospital? As a company we have always supported CSR initiatives and the cause of spreading awareness about breast cancer was something we saw we could integrate very well with Satya Paul being mainly a women-centric label. Apart from that Satya Paul has also supported the cause of the World Wildlife Fund’s endangered species campaign by dedicating a limited edition line to it a few years back. As a company we keep holding other initiatives such as blood donation camps with the Rotary and by planting trees. We feel it is very important for corporations to give back to society. How do you supervise so many diverse brands? Managing a large business can be stressful. That goes without saying, but we have great leaders in the company who manage different brands and I do not need to get into micro management. Hence I can concentrate on growing the business and strategy. Which company do you see as the closest rival? None, as there is no other established luxury conglomerate in India yet. Satya Paul is 25 years old. To celebrate, what was the idea behind the launch of the Delhi Eye (Shah Rukh Khan) and the Satya Paul anniversary celebrations? The year 2010 is a landmark year for both the brand Satya Paul as it completes 25 years and for Delhi as we have hosted the Commonwealth Games. Both occasions came together last month when the Delhi Eye was proposed to be launched by none other than the iconic SRK. We felt it was a great connect and used the occasion to celebrate 25 years of Satya Paul with a fashion show. I am 42 in years and 24 in the mind!